Hi - first post from a new member. Have a 2008 RS4 coupe. Need to replace my subframe. I got a used subframe from a 2008 S4 - didn't realize it was a convertible. Structurally they are identical except for: (a) 2 small attached fixtures for the additional attachments for the cabriolet rigidity (no issue), and (b) the bolt bushings. 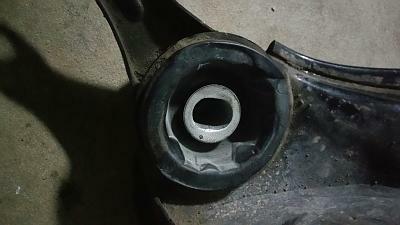 In my original subframe, the bushings consist of a metal core within a rubber surround bushing. 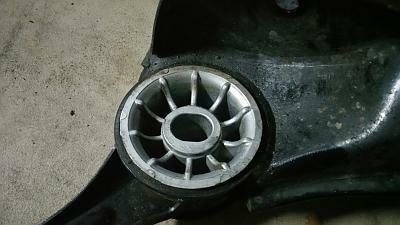 In the Cabriolet subframe, the whole bushing is solid metal. Both bushings appear to the same dimensions. Other than perhaps a little more road vibration from the lack of a rubber surround, are there any reasons why I cannot use this subframe?